Easy Vegan Chocolate Peanut Butter Bars (V, GF): a 4 ingredient recipe for healthy gluten free peanut butter bars! 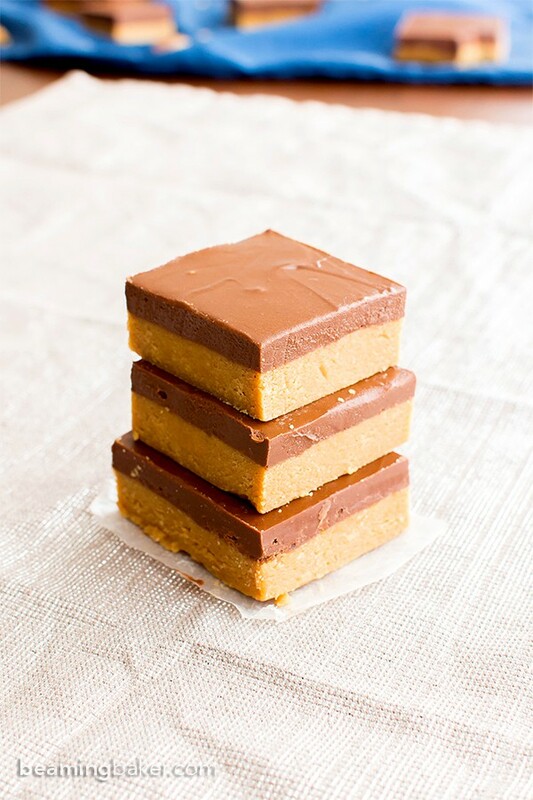 The best dairy free dessert recipe: yummy no bake peanut butter bars! Quick ‘n simple vegan dessert, Gluten Free, Dairy-Free, Vegan. Have you tried making my 4 ingredient Vegan Chocolate Peanut Butter Bars? They’ve been one of my most popular recipes since I shared them a few years ago—along with the paleo version: No Bake Paleo Chocolate Almond Butter Bars. Today, I thought it’d be high time to share some new photos, a bit of a recipe revamp and answer your common questions about my easy vegan chocolate peanut butter bars. Are you ready? Let’s do it! You might be asking, what the heck are no bake chocolate peanut butter bars? 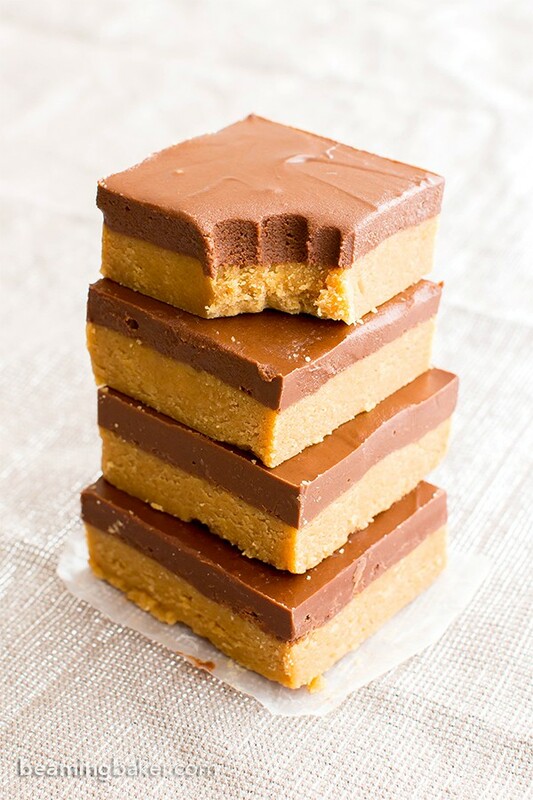 Some folks know them as Lunch Lady Peanut Butter Bars, Homemade Reese’s No Bake Peanut Butter Bars, or even No Bake Cafeteria Peanut Butter Bars. 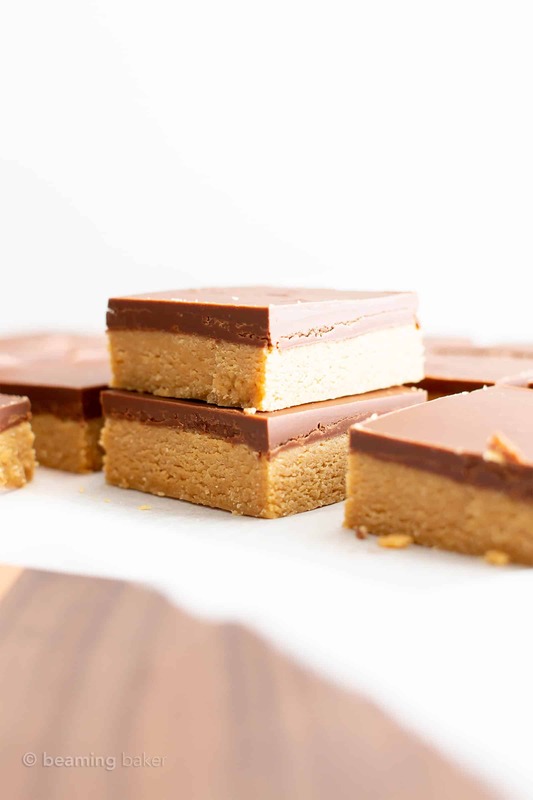 The classic version of peanut butter bars include 2 layers: one layer that’s firm & sweet featuring peanut butter, and the second is the chocolate topping. How is my recipe for no bake chocolate peanut butter bars any different? 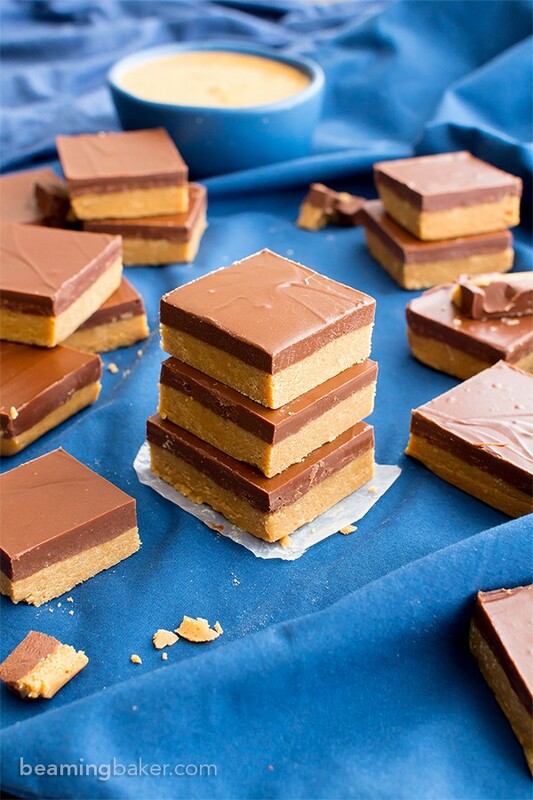 Most no bake peanut butter bars are made with a combination of butter, confectioners sugar and graham crackers. Years ago, when I really, really craved/needed to make a healthy, vegan + gluten free peanut butter bar, I realized that I had to leave those ingredients out. 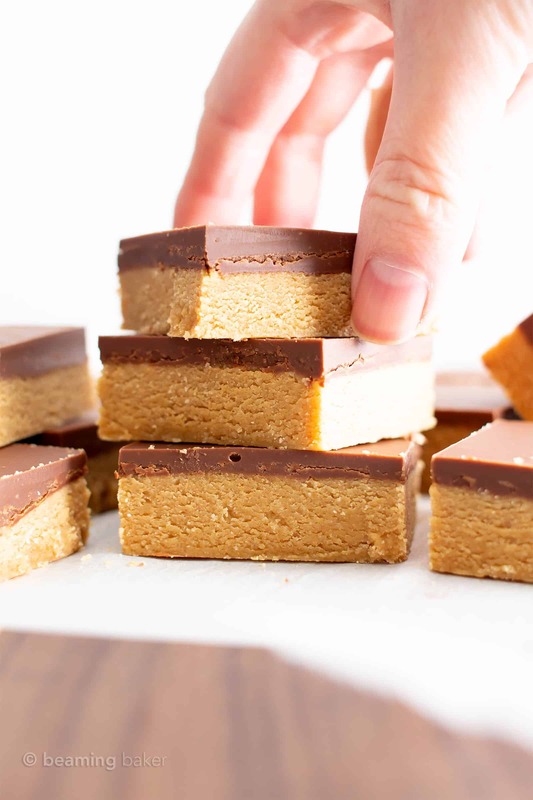 Quick & Simple Vegan Peanut Butter Bars—in 4 ingredients! My very favorite dairy free peanut butter bars can be made with just 4 simple & healthy ingredients. 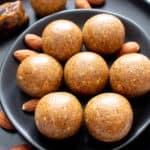 They’re so easy to make, gluten free, vegan and delish—basically my favorite easy vegan dessert recipe! Ingredient 4: coconut flour – which makes it grain-free! 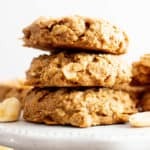 I was a little too proud of myself for figuring out that my heretofore enemy, ahem, otherwise known as the indomitable coconut flour, could be used as a healthy, grain-free thickener for the peanut butter layer in these healthy peanut butter bars. Combined with maple syrup, well, you’ve got the tastiest vegan peanut butter bars. Like, ever. Step 1: Combine peanut butter, maple syrup and coconut flour in a bowl. Whisk & fold until deliciously thickened. Step 2: Pour this peanut butter mixture into a prepared pan & smooth into an even layer. Step 3: Melt together vegan chocolate chips & remaining peanut butter. Stir until silky smooth. Step 4: Pour the melted chocolate mixture over the bars. Step 5: Chill until completely firm. Step 6: Slice & enjoy the best healthy peanut butter bars! 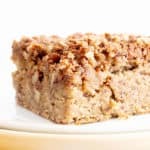 How Do I Make these Easy Vegan Chocolate Peanut Butter Bars Paleo? Easy, use my No Bake Paleo Chocolate Almond Butter Bars recipe! It’s also dairy-free, vegan, gluten-free and made from healthy ingredients. Simple & Easy Gluten Free Dessert: Healthy Vegan Peanut Butter Bars! Isn’t that basically the best easy vegan chocolate peanut butter bars recipe. Evah?!? It’s so simple that I constantly get comments & emails being like, “Uhhh… I really didn’t think these gluten free peanut butter bars would work. But it did. And it’s AWESOME! !” and… “also, can you move next door so I can help you ‘taste-test’?” Tee-hee!! The best part is that these no bake chocolate peanut butter bars are made without powdered sugar, butter or graham crackers. How cool is that? These gluten free peanut butter bars are easier to eat than they are to store. But they’re also easy to store. Lol. On the 1st day, the chocolate topping still needs to set, so you’re better off storing your healthy peanut butter bars in the fridge. After Day 1, go ahead and store your PB bars at room temperature, out of direct sunlight. 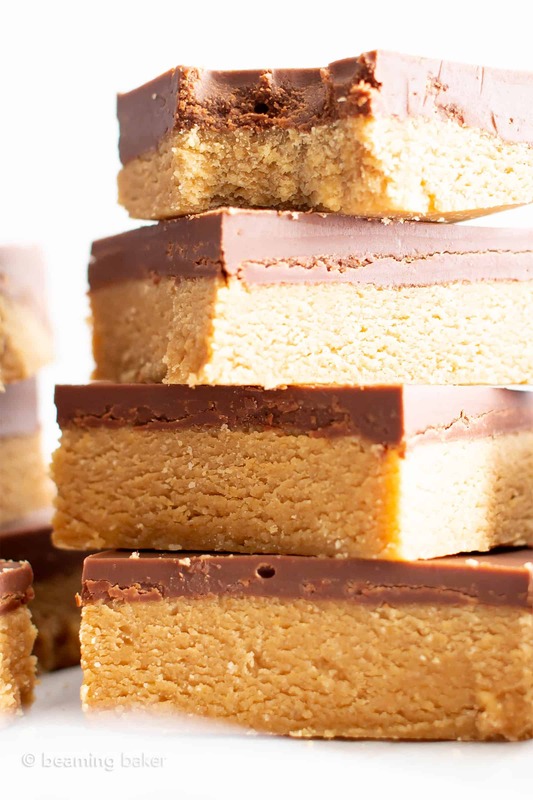 Great news: you can keep your healthy peanut butter bars for up to 2 weeks! 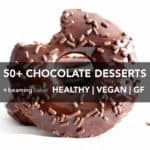 If you’re looking for more quick ‘n simple vegan desserts, try my favorites below! They’re all gluten free & dairy-free!! Easy Vegan Chocolate Peanut Butter Bars (V, GF): a 4 ingredient recipe for healthy gluten free peanut butter bars! 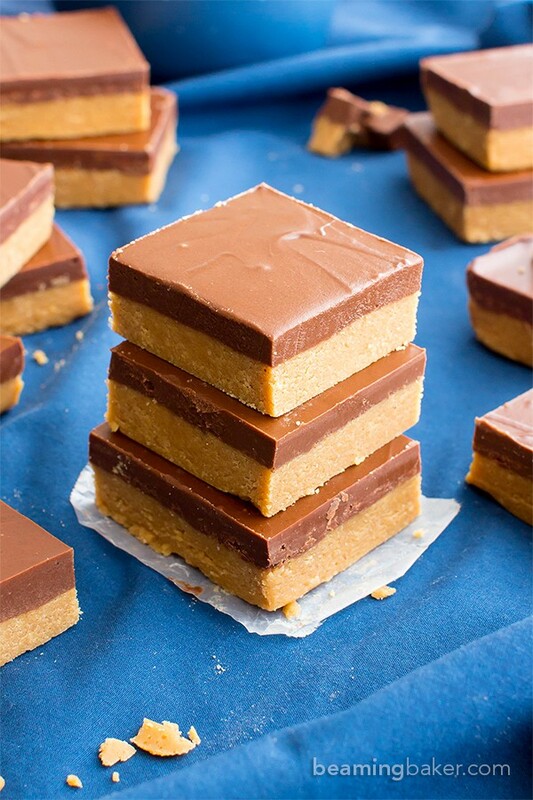 The best dairy free dessert recipe: yummy no bake peanut butter bars! Quick 'n simple vegan dessert, Gluten Free, Dairy-Free, Vegan. Line an 8-inch square baking pan with parchment paper or wax paper. Clear some space in the freezer for this pan—you’ll need it later. Set aside. 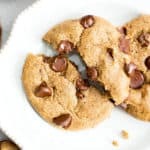 Make the Peanut Butter Layer: In a medium bowl, add Peanut Butter Layer ingredients: 1 cup peanut butter, ¼ cup + 2 tablespoons maple syrup, and ½ cup coconut flour. Using a rubber spatula, stir and fold until well-mixed and thickened, with no visible flour patches remaining. Transfer peanut butter mixture into the prepared baking pan. Using the rubber spatula, smooth into an even layer. Set aside. 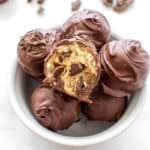 Make the Chocolate Topping Use the double boiler method or the following. Add Chocolate Topping ingredients to a medium, microwave-safe bowl: 1 cup chocolate chips and ½ cup peanut butter. Heat in 20-second increments until chocolate is softened and melty. Stir in between heating increments, until smooth. Pour the chocolate mixture over the peanut butter filling. Using a clean rubber spatula, smooth into an even layer. Tap the pan a few times to help even out the chocolate. Transfer pan to freezer. Freeze for 45-60 minutes, or until firm. Remove from freezer and slice into 16 bars. Enjoy! Storing instructions below. Also try my 4 Ingredient No Bake Chocolate Peanut Butter Cup Oatmeal Bars and my Peanut Butter Chocolate Chip Oatmeal Breakfast Bars. 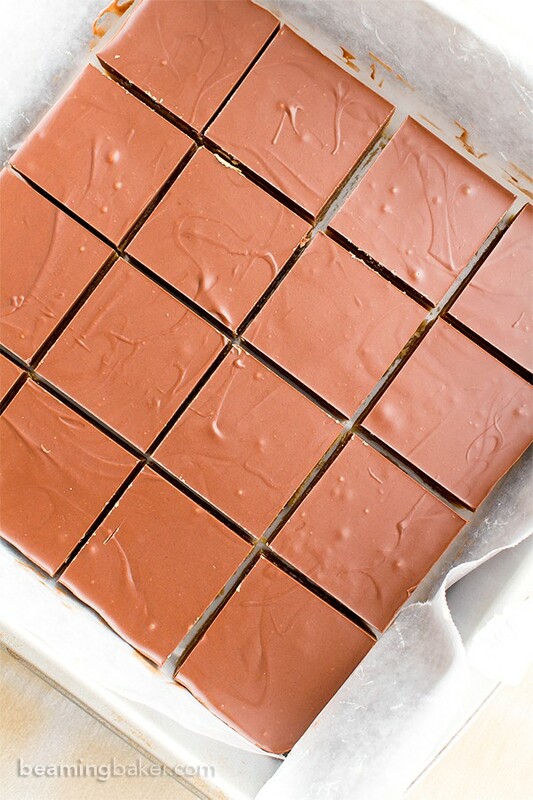 For the Paleo version: No Bake Paleo Chocolate Almond Butter Bars. - On the first day, these bars are best stored in the refrigerator, as the chocolate topping hasn’t fully set yet. Serve and enjoy within 1 hour. - After the first day, you may store these bars in an airtight container at room temperature (1-2 weeks), refrigerator (1-2 weeks). Starting week 2, the bars are a bit drier (like Reese’s PB cup filling), but still delicious. - To freeze: these bars freeze well. Store in an airtight container in the freezer for 1-2 months. Thaw at room temperature for 10 minutes before enjoying. 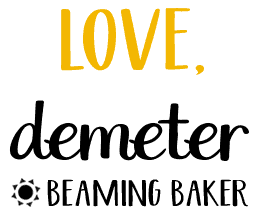 Tools for Making Easy Healthy Gluten Free Vegan Peanut Butter Bars & Desserts! 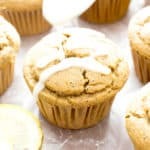 Coconut Flour: one of my favorite ingredients to use in gluten free vegan desserts! 8-inch Baking Pan: just the perfect pan for baking & no-baking vegan treats! 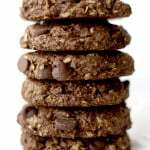 Vegan Chocolate Chips: no vegan kitchen is complete without some amazing vegan chocolate! 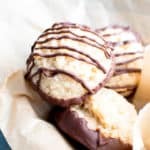 Previous Post: « Vegan Almond Joy Coconut Macaroons Recipe – Gluten Free, Paleo, 6 Ingredients! Yay! So happy to hear it Jessica! Oh yummmm you had me at no bake. Will certainly be giving these a try. They look incredible. Yes! No bake treats are the best. 😊 Hope you enjoy Rosa! Terrific photos. I love any sort of chocolate and peanut butter dessert! Aw thanks Jill! ☺️ Same here, chocolate + PB is soo good! 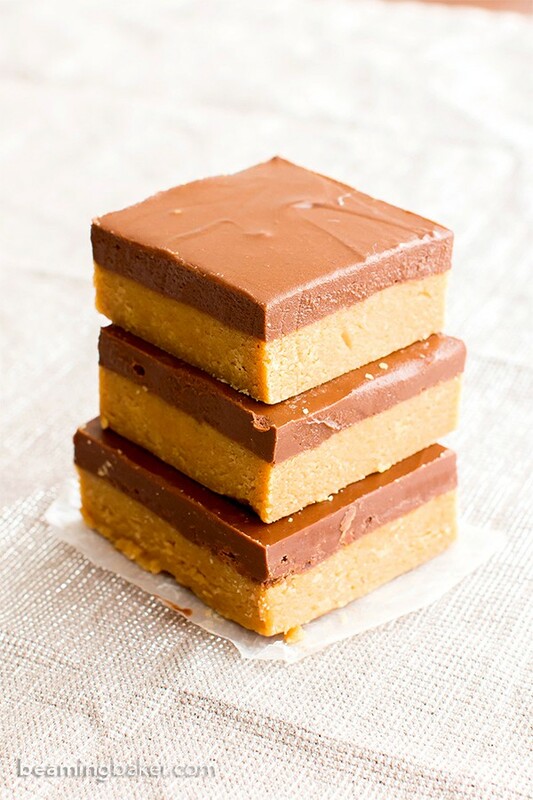 I remember those lunch lady peanut butter bars and always loved them. Thank you so much for this healthier version. I’m going to test them out this week! I simply LOVE peanut butter and chocolate together! These bars look amazing! It’s one of my face combos! 😋 Thanks Natalie! I love these awesome delicious bars, so easy to make and comes out perfect every single time. Looks delicious! Thanks for sharing. 🙏 Question: can you substitute almond flour for coconut flour and sugar free syrup for maple syrup in this recipe? I’ve done this with other dessert recipes but those required actual baking time. These are my weakness! My husband is not a peanut butter fan so I will have to hide them from myself. But they look divine, and I am making them today. I’m sure they will be perfect because of you!! Thank you so much Alene! Your comment brought a big ‘ol smile to my face. 🙂 Can’t wait to hear what you think! I’m all for anything chocolate and peanut butter! Love the combination. These look AMAZING!!! Looks like I have baking plans for this weekend! Haha thank you Bee! 😊 Hope you enjoy them! Oh these bars look delicious! 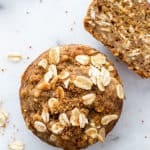 Omg, this recipe has my name on it! I’m totally drooling over this goodness, can’t wait to try!